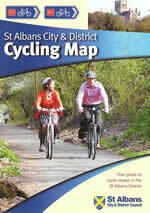 The town/district cycle maps are available to help both new and experienced cyclists to plan their routes across both Stevenage and the district of St Albans. The map shows a variety of routes such as on-road cycle lanes, shared pavement routes, off-road routes and routes suggested by local cyclists. The Alban Way is a trail for cyclists and walkers along a former railway line. It is an important link in the local sustainable transport network and forms part of Route 61 of the Sustrans National Cycle Network. The Alban Way has a smooth surface, suitable for all users, with lighting at the Hatfield end. It has many access points, most of which are ramped or level. It provides a route for leisure, commuting and safe routes to school. The Alban Way is 6½ miles long (about 40 minutes cycling). It runs between Cottonmill Lane in St Albans and Wrestlers Bridge in Hatfield, providing a safe link between these two towns. The Cole Green Way proper runs from the outskirts of Welwyn Garden City at the Black Fan Road / Cole Green Lane junction to West Street in Hertford. This rural section follows a former railway and is suitable for walkers, cyclists and horse riders. This part of the route is also accessible for disabled visitors at various points. Motorised scooter wheelchairs are probably the best option due to the nature of the surfacing. There are also links at both ends that take walkers and cyclists into Welwyn and Hertford town centres. The link through Hertford joins the towpath along the River Lea, taking you to Ware and beyond. It is signposted through the town centre. Enjoy this route for a leisurely walk or ride alongside waterways and rural tracks. It links three Hertfordshire towns with some great countryside. You can even take a circular diversion to explore local villages near the path. Why not use the path for a journey to work? With traffic congestion particularly heavy traffic congestion between Hertford and Ware, make the journey to work an enjoyable experience by cycling alongside the river. The Grand Union Canal wends its way from London to Birmingham through city, town and country. Improvements to the towpath between Leavesden and Rickmansworth provide a good, flat surface for walkers, cyclists and wheelchair users. Enjoy the peace and tranquillity of the canal or use the route as a traffic free journey to work away from busy roads. Between Leavesden and the Aquadrome in Rickmansworth it is about a 45 minute easy bike ride over 5 miles of towpath. There is so much to see and do along the way. Explore ancient woodland and roam between the trees in Whippendell Wood. Take the kids to Cassiobury Park and ride the miniature railway or get back to nature at the Aquadrome. For those wanting to explore further, walk or cycle through history looking for the clues of the old railway line along the Ebury Way. Alternatively follow the towpath south towards London and Uxbridge or north towards Hemel Hempstead. The guide will show you many places of interest en route, as well as all the access points including links into West Watford and Rickmansworth town centre. The Great North Way (Route 12) forms part of the National Cycle Network. When completed Route 12 will link London with Grimsby via Peterborough. In Hertfordshire it takes you from Potters Bar (Hadley Wood) to Letchworth and Baldock – a 32 mile ride. You may not want to cycle all of the route, but not ride part of it? You could even cycle one way and take the train back. The map also contains information on interesting places to visit along the route, with an emphasis on free or less expensive attractions. Take a diversion down one of the three old railway line cycle routes, expand your mind in Mill Green or Letchworth Heritage museums, explore woodlands or take a trip round Letchworth on its Greenway. The Nickey Line was a 7 mile branch line that once linked the mainline in Harpenden with Boxmoor, near Hemel Hempstead. Much of the track bed still remained intact when it was bought by Dacorum and St Albans councils in the early 1980’s and opened for walking and cycling. The route now forms a pleasant green corridor with a rural aspect along much of its length – providing attractive countryside or woodland walks as well as generally traffic-free access to school and work. Although there are steep embankments or cuttings and several bridges have been removed there is level access for cyclists and wheelchairs along most of the route. The Nickey Line forms part of Route 57 of the Sustrans National Cycle Network which continues through Harpenden to Wheathampstead and Welwyn Garden City. From Harpenden Route 6 goes south to St Albans and Watford, and north to Luton and Milton Keynes. Enjoy the route as a relaxing journey to work or school away from the road network. Alternatively, take a leisurely walk or ride looking out for the abundant local wildlife. In addition, a number of circular paths can be enjoyed incorporating rights of way which cross the line. The recently upgraded Ayot Greenway now runs from the heart of Welwyn Garden City town centre directly into Wheathampstead village centre. Traffic free for a majority of its length, the route predominantly follows the old trackbed of the former Welwyn to Luton branch line which closed in the 1960’s under the Beeching cuts. The leaflet also shows many connecting footpaths and bridleways taking walkers to Ayot St Lawrence, Lemsford and the grounds of Brocket Hall. This map has been developed to help you travel around the area by foot, bike and public transport. Each grid on the map represents and average 10 minutes walk or 4 minutes cycle ride, showing you just how quick it is to get around the area under your own steam. Here is an open space within walking distance of almost every home and office, and many more are just a short trip away. The Activity Map shows open spaces to discover, cycle tracks to ride and parks to play in. So get outside, breathe in the fresh air and take a bit of gentle exercise. Whether you want to walk the dog, cycle, have a family picnic, grab a sandwich away from the office or kick a ball around with your grandchildren, use the guide to enjoy the local area.